One of my “go to” questions for students when they are working through math in my classroom is, “Will that always be true?” I find it pushes the thinking to another level where students are looking for examples and/or non-examples. On Twitter one evening I found a blog post by @lisabej_manitou that was the embodiment of my go-to question: http://crazymathteacherlady.wordpress.com/2013/11/20/always-sometimes-never/ . Can you say perfect timing, as my class is in the midst of quadrilateral properties/classifications? I gave each group of students Lisa’s sheet, clarified any key vocabulary questions and the conversations started rolling! We have been doing a lot of work with classifications and discussing all of the classifications polygons can have, but this activity took that to a great new level. The “Sometimes” column has to be my favorite because it requires to think of both cases, true and not true. One group had a very “heated” debate on the “Square is a Rectangle” card, which if you asked me ahead of time, would not have been the one I expected to hear such debate (at least in the respect that it was). 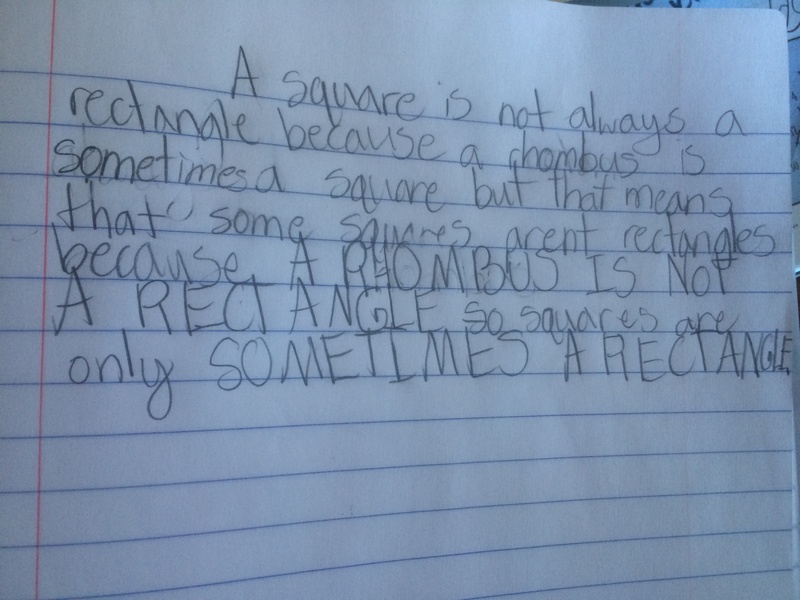 I know that often students come into this unit having formed or memorized some form of the statement that “Squares are rectangles, but rectangles aren’t squares.” Whether it is taught or formed on their own, it is put to test when faced with the always, sometimes, never. Those are the words that are key in the misconceptions built around that statement. That was the conversation I expected to hear when I walked over to the group and looked at the card in question…however it was actually quite different reasoning! She made an interesting point for students to reason about. 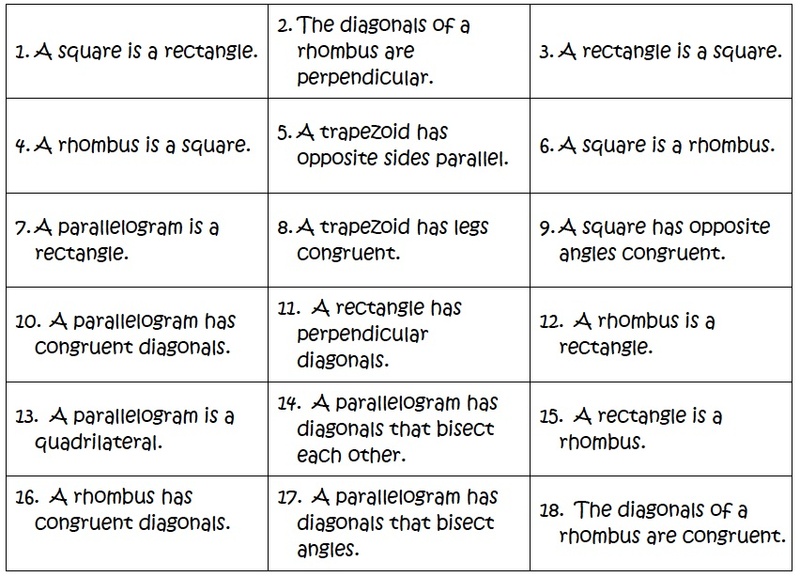 If a rhombus can be a square, and rhombuses (or is it rhombi?) are not rectangles, squares can’t always be rectangles. I pulled the class together to discuss this point because there were others agreeing with her reasoning. They SO wanted me to tell them who was right and who was wrong….um no way! I asked them what would prove or disprove this argument to them. One group said they would need her to show them an example of when a square was not a rectangle because if it is sometimes, it has to be a case of when it is and isn’t. And, class dismissed. They left wanting to continue: creating arguments, critiquing the reasoning of other, making mathematical models, looking for patterns in their reasoning….I would say it was a great day in math! I am SO glad they didn’t finish yet bc I am planning on recording some conversations on Monday to post. Thanks Lisa for the great lesson! This entry was posted in Geometry, Math, Uncategorized and tagged 5th Grade, Geometry, Math, Quadrilaterals, Rectangles, Squares on January 25, 2014 by mathmindsblog. I am so excited that you were able to use this! It is so interesting to hear how students understand concepts. I love that they were getting upset about it! I love this lesson. Can’t wait to try it out in my classroom. And I love, love, love how the student’s explanation became more heated and she had to resort to all caps. Passion and math – aaah.